Last week we looked at where Rahm Emanuel had support in his 2011 election and how that might shift, but one of the major pieces of geography that will change in 2015 are the boundaries themselves. In 2012 aldermen approved a new ward map, as they do every 10 years with the decennial census. And as is also a Chicago tradition, there were calls of gerrymandering, civil rights abuses and the eventual lawsuit. Chicago’s redistricting efforts have been challenged in three of the past four attempts going back to 1980. That’s why you’ll find two different maps in use in the 1980s and 1990s, and very possibly later this decade as well (A lawsuit from the League of Women Voters is working its way through the courts). Inspired by a series of articles from the Washington Post’s Christopher Ingraham, we decided to see just how gerrymandered Chicago’s wards have become. Ingraham created a 0-100 scale to measure the level of gerrymandering in congressional districts and we reproduced that to see how Chicago’s wards stacked up to Congress. We used maps from three sources: The Historical Urban Ecological data set, the University of Chicago, and the city of Chicago. We loaded those maps in a PostGIS database and followed Ingraham’s methodology, specifically applying the Polsby-Popper method to determine a gerrymandering score (on a 0-1 scale), then converting it to a 0-100 scale. -Polsby-Popper isn’t the only way to measure gerrymandering and may not capture aspects some would associate with gerrymandering. We followed along with Ingraham’s method to make comparisons. -A perfect compactness score of 0 would be a circle, but no area can be split into a bunch of circles. A series of perfect squares would score 21.5. -Compactness of a ward doesn’t take into account population, demographics or keeping communities together, something required by the Voting Rights Act. That means sometimes a less-compact district can better serve a community. -Chicago is a weird looking city (geographically speaking). With Lake Michigan, the O’Hare annexation and its extreme North-South orientation, there are a lot of irregular boundaries. The city itself scores 88.8 on our gerrymandering scale (which may say something about how the city came together, but that’s what we’re working with). With that said, this is a good starting point to look at how Chicago’s wards have changed over the years, and how it compares to other civic divisions. 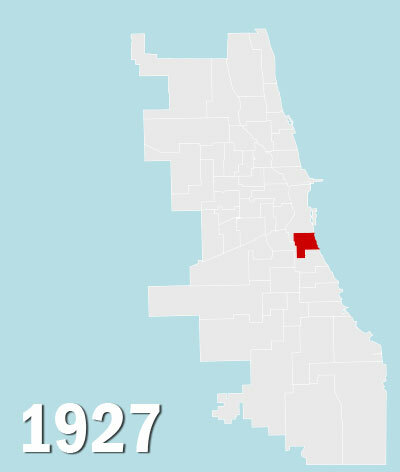 Chicago first split into 50 wards in the 1920s. Before then there were 35 wards with two aldermen each. Reformers hoped that having one alderman per ward (and 50 instead of 70) would help reduce corruption. The fact that this story exists implies that it did not. That first attempt at 50 wards (with annexation thrown in in 1927) is pretty compact, and contains mostly shapes your toddler could name. You can see in the map above that most ward lines are fairly straight, with the Chicago River the main natural divider creating some squiggles. At this point the 2nd Ward is a fairly regular shape, more or less a six-sided polygon. 2nd Ward score: 43.37. Chicago score: 48.74. Fast forward to 1986 (the next year we could find electronic ward maps). 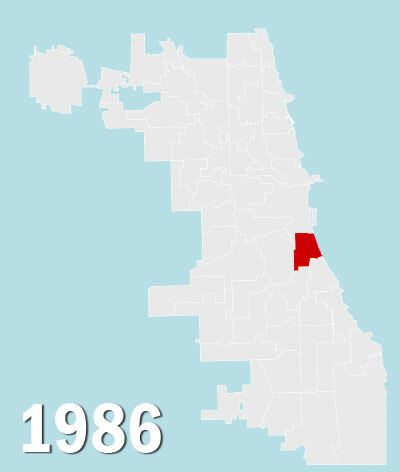 These boundaries were drawn after the election of Harold Washington as mayor and a 4-year-long court battle, so would only be in effect until 1992. While the map as a whole has undergone some major changes, the 2nd Ward is relatively close to its original shape. The boundaries to the north, west and east are in basically the same spot, but it has grown to the south. Also, notice how the southern boundary is more irregular. 2nd Ward score: 45.06. Chicago score: 61.58. Following the 1990 census the Chicago City Council couldn’t decide on a new ward map so they sent two proposals to voters in a referendum. Again, the choice was challenged and went to the courts, and a new ward map came in 1998. The process cost the city $18.7 million. This is the first major change for the 2nd Ward. Other than its eastern edge on Lake Michigan, the whole thing is blown up and now resembles something like a transposed ‘L.’ Not only does most of it move north, but its long, skinny shape extends west halfway across the city. In this one change, the 2nd Ward goes from one of Chicago’s more regular wards to one of the more gerrymandered. While the new 1998 map had some big changes for certain districts, there was little change as far as the gerrymandering score for the city or Ward 2. 1992: 2nd Ward score: 84.89. Chicago score: 69.91. 1998: 2nd Ward score: 85.10. Chicago score: 69.71. 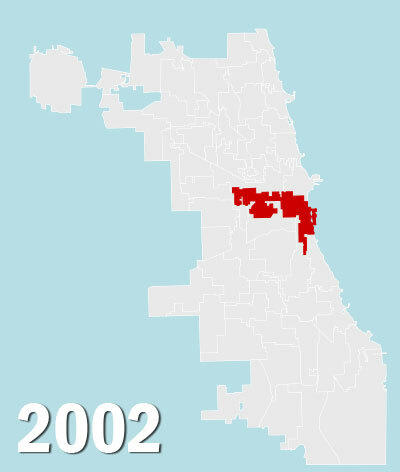 After the 2000 census an amazing thing happened: Chicago passed a ward map that didn’t get thrown out by the courts. In true Chicago style, though, this came because of more gerrymandering, not less. Mayor Richard M. Daley worked with black and Latino councilors to craft wards that were acceptable to them, creating safer constituencies at the expense of compactness. The 2nd Ward is barely touching its original area, a plume of smoke rising from the ashes of its foundation. Its continued its northern path and now swallows up Burnham Harbor, Soldier Field and and the Field Museum. This is the first time the 2nd Ward is Chicago’s most gerrymandered, narrowly passing the 41st (91.28). 2nd Ward score: 91.33. Chicago score: 69.71. 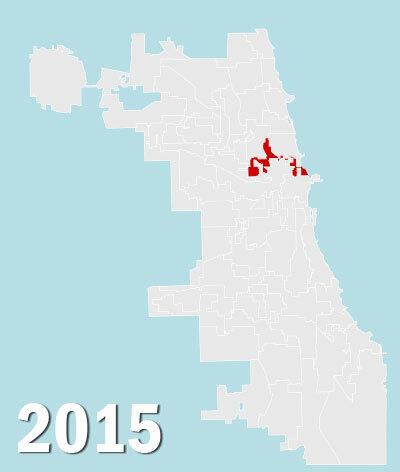 These are the wards that will elect our next round of aldermen in February, unless of course they don’t. The 2nd Ward was moved not only entirely north of where it was in 1927, but north of where it was in 2002. This got a lot of attention after the map was approved in 2012, because it moved current 2nd Ward Alderman Bob Fioretti into the 28th Ward, seemingly a punishment for not sticking with Mayor Rahm Emanuel. WBEZ produced an interactive map of the new wards along with demographic profiles of each ward back in 2012. Check out that link for more information on the process as well. The end result is that the 2nd Ward is now solidly Chicago’s most gerrymandered, with the 1st Ward ranking second at 91.48. 2nd Ward score: 94.16. Chicago score: 74.18. Going back in Ingraham’s work with states and congressional districts, Chicago and the 2nd Ward fit in pretty well. Chicago matches up well with states like Missouri as in the upper half, but not near the most gerrymandered. The 2nd Ward, though, would be just outside the top-10 for most-gerrymandered district (Illinois 4th is No. 8). Again, these scores may be indicators of gerrymandering but is by no means the final word. That will come later from the legal system.